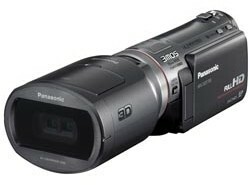 We'd heard Panasonic was planning a more affordable stereoscopic 3D camcorder, but it looks like we won't have to wait until a mysterious July 28th Tokyo unveiling to find out for sure -- it's called the HDC-SDT750, and Panny's advertising it as the "World's first 3D Shooting Camcorder." Leaks at all the seams of the company's website afforded us the above picture, and the surprising revelation that the product may not be a brand-new camcorder, but rather an existing high-end 3MOS model (we'd guess the HDC-HS700) with a "3D conversion lens" attached. If the yet-to-be-activated product page's source code can be believed, the SDT750 will shoot in 1080p AVCHD at 60fps, feature Panny's proprietary Hybrid O.I.S. image stabilization technology, and come in a lovely shade of Henry Ford black. That's all we have for now (save a second tiny picture after the break) but rest assured we'll be keeping tabs on this one. Update: Looks as if even more images and purported specifications have leaked out ahead of the official reveal. The Khan Shatyr World’s Biggest Tent in Astana!